I keep seeing this pretty kitchen from Midwest Living pop up on Pinterest. What is it that makes this kitchen so popular? The crisp, white cabinetry is right on trend and the open shelves displaying pretty dishes and jars are classic farmhouse. 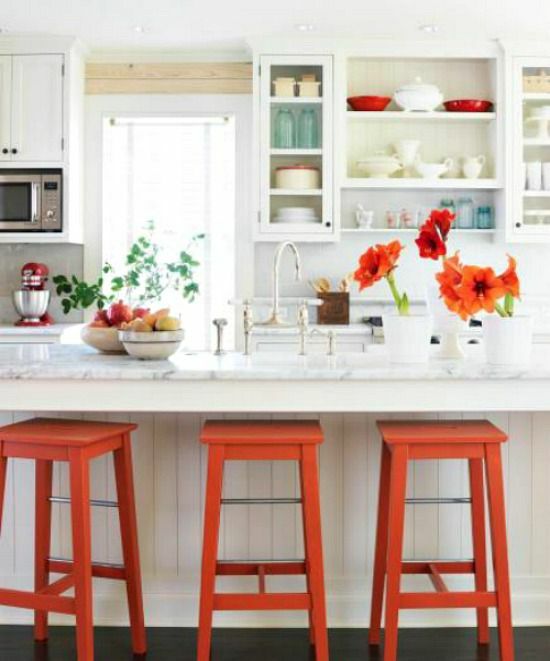 Those orange stools are a fun pop of color that really takes what could be a run-of-the-mill country kitchen to a whole new level of fun design. I challenged myself to find at least five tutorials for projects that might help me replicate the look of this room.